South Africa has 700 publically owned reserves. The list includes 19 national parks. Over and above that are at least another 200 private reserves. Making a choice as to which ones to visit can be rather difficult. As a consequence most visitors simply head to the Kruger National Park – it’s an obvious choice. South Africa is hugely diverse. It’s habitats range from the intense heat and red sand dunes of the Kalahari to the subtropical wetlands of the Elephant Coast. It has great swathes of mountain belts like the Drakensberg and the Cape Fold Mountains, densely forested kloofs, heaving waterfalls, and savanna grasslands that extend to meet the horizon. Within this medley are a myriad protected areas that house game. 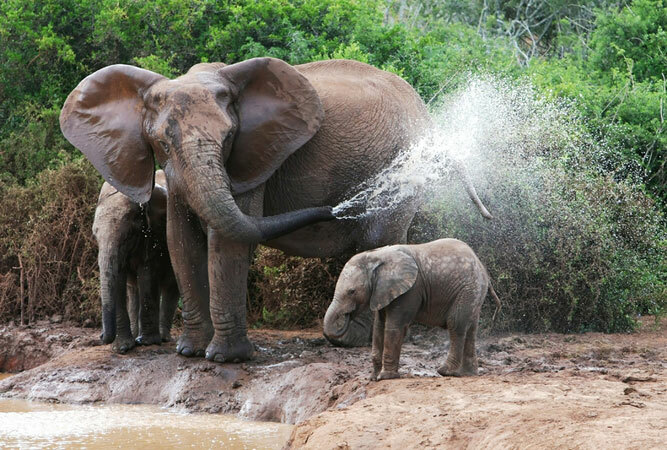 The main attraction of this game park beyond the obvious advantage of its situation only an hour’s drive from Port Elizabeth, is the elephants. The park is home to over 500 African elephants – amazing if you consider that Addo was originally established in 1931 to save eleven of them. It is also the third largest national park in the country. Spanning from the semi-arid Karoo to the north of Darlington Dam, across the Zuurberg Mountains, through the Sundays River valley and south to the Sundays and Bushman’s river mouths, Addo also incorporates a marine reserve that includes the second largest breeding colony of African penguins, annual migration of whales, and St Croix and Bird islands. Why visit: because you will see a lot more than just elephants. Addo has lion, black rhino, buffalo, spotted hyena, a variety of antelope and zebra, meerkat, the flightless dung beetle, and the rather interesting secretary bird. 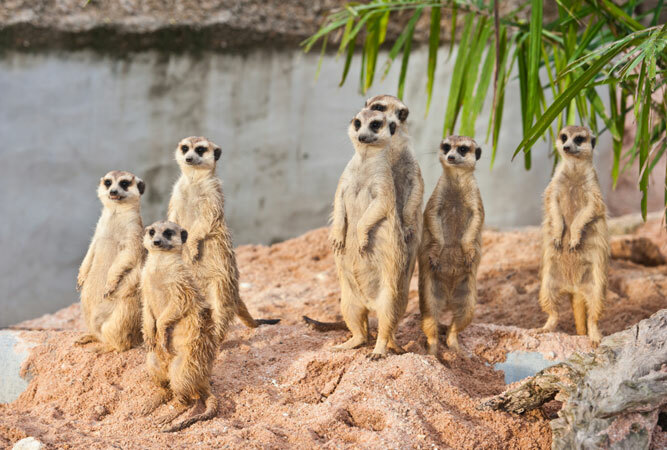 Kgalagadi is a multinational park that combines the Kalahari Gemsbok National Park of South Africa with the Gemsbok National Park in Botswana to form a massive, boundaryless 3.6 million hectares of conservation area. Only humans are expected to go through immigration controls, the abundant wildlife migrates as the need arises in a land of extremes in which drought is a frequent visitor. The sublime landscape of shifting red sand dunes, thorn trees, dry river beds and sunsets that heave orange and pink across the sky bring into sharp focus the reason for the reserve’s name – Kgalagadi means place of thirst. Rivers do not flow here more than once a century or briefly after electric storms. Instead water heads underground to nurture camelthorn trees and grass that gains a foothold in the river beds. 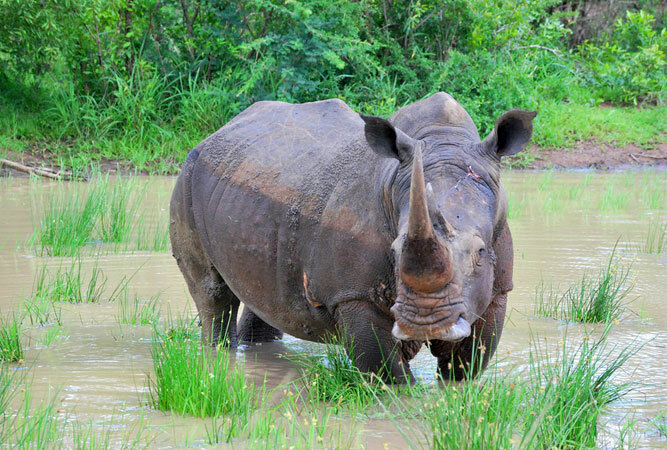 Africa’s oldest natural park, this is a country hewn with hills and wide, deep valleys – home to the largest population of white rhino in the world. The bonus is that it is a mere 2.5 hours’ outside Durban, making it easily accessible and the top game park in KwaZulu-Natal. It’s founding purpose was to save a population of southern white rhinos from extinction. From having only 25 rhino at its inception, Hluhluwe-Imfolozi now has over 1800. They have also supplied over 16 000 further rhino to other reserves in South Africa. Big 5 viewing makes the reserve popular, particularly during school holidays, the hills provide perfect viewpoints for spotting game, it is home to rare nyala and red duiker, and a rather heady mix of forest, grassland, woodland and savanna. Once known as the Greater St Lucia Wetland Park, iSimangaliso Wetland Park is South Africa’s third-largest protected area that spans no less than 280 km of coastline. Its incredible ecosystems that include major lakes, swamp foests, ancient coastal dunes, a huge estuarine system and scores of bird, animal and plant species mean it was attributed with World Heritage status as early as 1999. 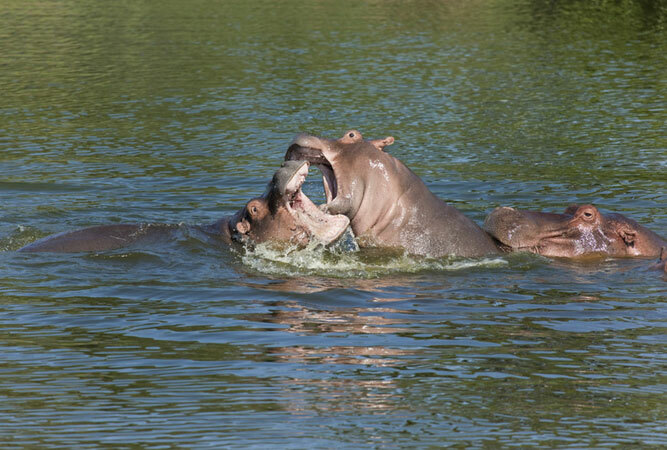 The park is divided into a number of parks and reserves, like Kosi Bay, Lake St Lucia, Cape Vidal, and Mkuze Game Reserve, and is soon due for integration into a transfrontier park to join other parks in Mozambique and Swaziland. South Africa’s newest national park, Mapungubwe was formerly known as Vhembe Dongola National Park. It lies far north in Limpopo at the confluence of the Limpopo and Shashe Rivers. A World Heritage site the park uniquely combines not only a huge array of birds and wildlife but also an extraordinary history. Up on Mapungubwe Hill are the remains of an African civilisation. From here archaeologists uncovered the golden rhino and Iron Age relics. But it is the scenery that will blow you away – sandstone formations, mopane woodlands, savanna and riverine forests. 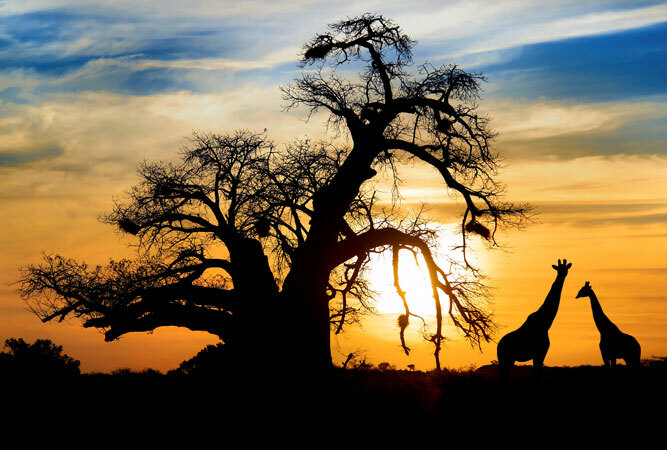 Why visit: giant baobabs, lions, elephant, white rhino, leopard, wild dogs, hyenas, 400 species of bird, and the history of an African gold-trading civilisation that dates back over 1000 years.